Let’s face it, some office supplies are really difficult to purchase. Various sizes, styles, features and colors do nothing but confuse most people. I’m all for big selection when is comes to office products, but often times businesses are hit by “variety overload”. Have you ever tried to buy an item like classification folders before? Its like solving a puzzle. Dry erase boards, or marker boards as they are often called, are one such product. Read on to take the mystery out of buying the right marker board for your home, office or school. To illustrate how confusing buying dry erase boards can be, let’s look at the name. Most office supplies companies call these products dry erase boards, but the average person on the streets doesn’t really know what dry erase means. So we hear a variety of names used for these products like marker boards or white boards. 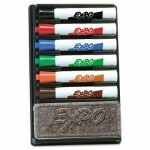 EXPO Dry Erase Markers are the most popular brand. This starter kit is a nice value! White boards are actually called dry erase boards because of the marker that is used to write on them. Simply put, dry erase markers can be erased without using any moisture. They erase easily with a dry cloth, paper towel or one of those foam erasers you can buy. 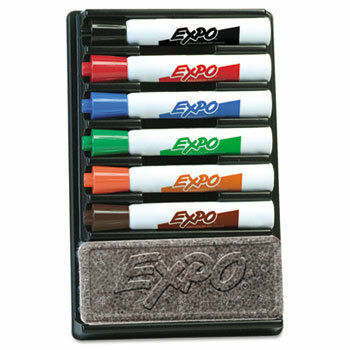 The opposite type markers are called wet erase markers, and these require a moistened towel or water to cleanly erase. Now that simple fact is clear, let’s get to picking out the optimal product for you. You’ll want to start first by identifying the perfect size for your needs. Don’t guess, but instead get a measuring tape and see the size available for your board where you plan to hang it. Marker boards come in many sizes from huge 4′ x 12′ boards all the way down to tiny 8.5″ x 11″ boards for the refrigerator. Remember that the larger the board the better, because people tend to buy boards that are too small for their needs. Most popular sizes are 1.5′ x 2′, 2′ x 3′ and 3′ x 4′, but check with your office supply dealer as there are several other sizes available. After you know the size, then select the optimal writing surface for your board. For years, all boards were either porcelain which is very expensive, or melamine which is must cheaper, but also tends to stain and not be very durable. “No ghosting” surfaces are now very popular, and while a little more expensive than melamine, boards like the Quartet line of Total Erase are guaranteed to not stain or ghost, and they are more durable. However, melamine boards are still by far the most popular surface because they are less expensive and generally do a good job for normal use. If melamine is good and Total Erase is better, what is best surface? That’s porcelain boards, which have a thin coating of porcelain that is 100% stain resistant over steel, which gives the board a magnetic feature for posting items on your board with magnets. While porcelain boards are very expensive, they also last longer and perform the best. I highly recommend these for high use areas if your budget allows , but you can also consider a new surface called “painted steel” which has most of the qualities of porcelain, at about 30% lower cost. They are, however, slightly less durable. 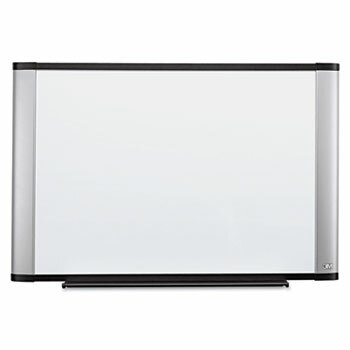 The new dry erase board line from 3M features a cool "flat screen" TV look. First is size, then is surface, and now is styling. By that I mean the style of frame that is right for you. A boards frame is what creates it’s appearance on your wall, and if aesthetics are important to you there are several new and distinctive board frames available. Look at Total Erase or the new 3M line of marker boards that have the look of “flat screen” tv’s with attractive frames like maple, cherry wood or a smoke graphite frame for a techy look. There are always the old stand buys, oak and aluminum, if you want a low cost functional board for common areas. Aluminum frames have always been the #1 seller. 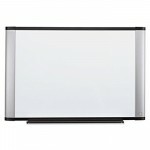 Once you’ve defined the perfect board for your needs, take the time to pick the best place to buy your dry erase board. The first rule of thumb is to never buy office supplies from the “Office Mega-Depot” mass retailers out there. Save money and get far better service buying office supplies online from an independent dealer. I found a great company that practices a new business model called conscious capitalism, and donates 50% of profits to great charities. They do good work in the community and help me do good work at my business. Oh, and their dry erase selection is awesome! This entry was posted in Office Supplies Shopping Tips and tagged 3M, conscious capitalism, Dry Erase Boards, Expo, Marker Boards, office products, office supplies, Quartet, Total Erase. Bookmark the permalink.